The Brampton Centennial Secondary School booth at the @peelschools Advantage Showcase demonstrated some of the best qualities of our school. It was designed by our Construction teacher, built by our students, and showcased student photography that brought BCSS to life. In the middle of the display was our school’s video, which you can check out at http://bcssonline.com. The parents and students who visited us asked great questions, as they “shopped” for their next school. Some seemed disappointed when we didn’t have a Regional Program like IB or SciTech, but were intrigued by our focus on on video communication, and our work to build video literacy, integrated into ALL our courses. So, what is our next step? Well, “seeing is believing”, so I need to get them into our school. We’re hosting an Open House on Thursday, December 5, 2013. Our goal is to showcase our school, not only to the grade 8 students who will be attending BCSS next year, but to our entire community. But, how do we get them there? 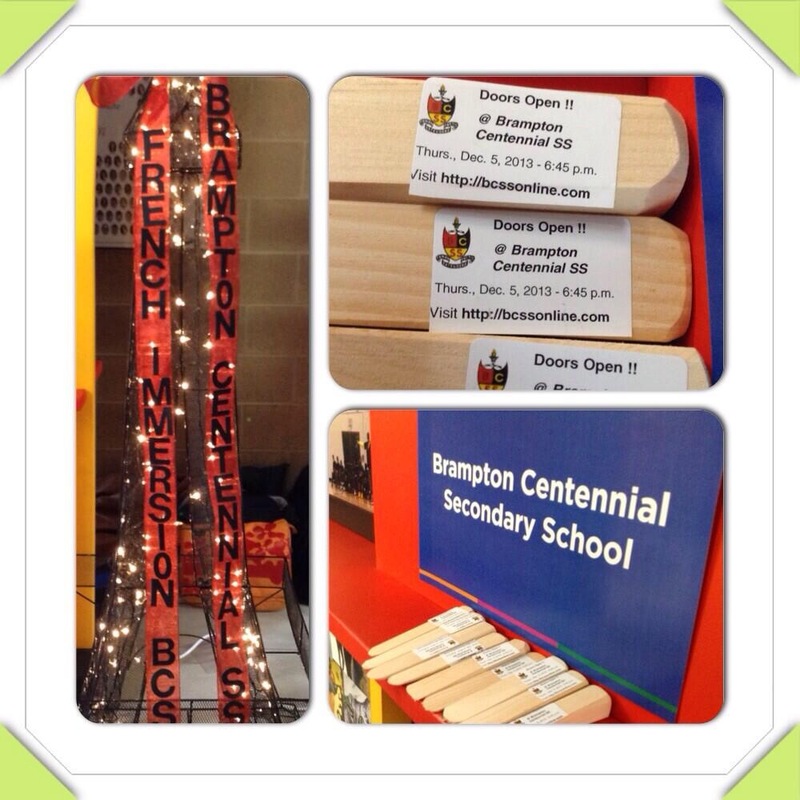 We’ve announced it on our website, sent a Synervoice message home to our families asking them to save the date, we’ll have it on our electronic sign, and on Saturday we handed our out student-made door-stops, with labels reminding them that “Doors Open @ Brampton Centennial SS”. What has worked for you? How have you convinced your community to take time to get to know you?